This supply chain study is a formative quantitative and qualitative research of consumer and supply chain analysis for rural sanitation. The intention is to diagnose at a very detailed level the distinct differences in physical and market environments, in order to inform subsequent programming. It also focuses on the commonly found or most preferred products and approaches for achieving improved sanitation outcomes in rural settings. Two hundred structured interviews were conducted with supply chain actors in seven provinces, including construction material suppliers, producers of prefabricated concrete products and masons. Local finance organizations were also interviewed. Also, over 100 people participated in 17 focus group discussions. 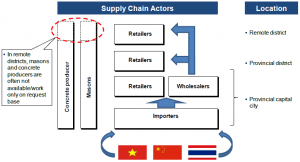 Different regions and districts have different supply chains, with different sources of products. The supply chain for sanitation is influenced by the nearest neighbouring countries as well as by the presence of international check points. Raw materials (e.g. latrine pan, cement, steel and zinc sheets) often begin in Thailand, but China and Vietnam play an important role as well. Many construction material suppliers act as importers, wholesalers and retailers, while some are just importer and retailer. EMC implemented the study for consortium of organisations, WSP (lead) Plan International, SNV and UNICEF. The final report is available online here.